This issue’s article (at the end of the newsletter) is by James Glover and describes his highly successful trip to India last month to promote Vedic Mathematics. The associated practice exercises for the five and half chapters of the Natural Calculator tutorials, have now been integrated into the main website (now being compatible with Smart Phones and Tablets etc.). These can be found at the "Tutorial" menu in the "vedicMaths.Org" website. Fixes to the scaling of the tutorials on desktop computers and phones have also been implemented. 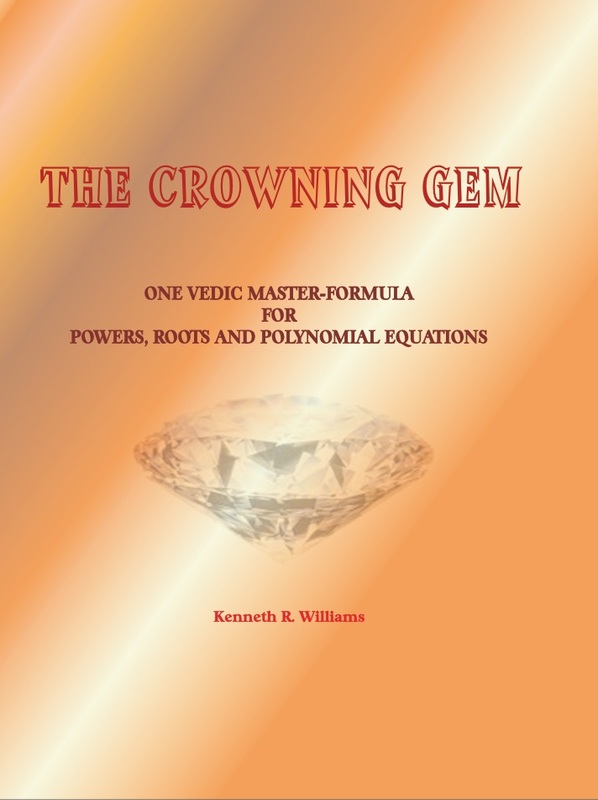 This course, “The Crowning Gem: Powers, Roots and Polynomial Equations” shows how to find Powers and Roots and also the Solution of Polynomial Equations. The technique is an extension of Bharati Krishna’s ‘Crowning Gem’ method. Earlier this month, I was in Delhi helping to promote Vedic maths in a number of schools and other institutions. Here is a summary of the various events. I was invited to give the annual Prof. Narendra Choudhuri lecture organised by Prof. Ramesh Bharadwaj, Head of Sanskrit Faculty, Delhi University. The lecture given to about two hundred people gave an overview of Vedic Mathematics and its place in education. It was well received. This meeting, organised by Ms Anupma Bhardwaj, Principal of JMV, again consisted of an overview of VM and its place in schools. This was attended by seven other principals and the entire Maths department of teachers at Tagore, both junior and senior. Ms Preeti Chadha, head of Junior school and head of Mathematics is particularly keen and would like the IAVM to work collaboratively with Tagore International to integrate VM into their curriculum. My initial idea on this was to create modules, each dealing with specific areas of VM and each covering a topic across several grades. Since then I have decided that it would be better to create an integrated curriculum by grade rather than by topic. There were two interviews. The first was a 45 minute interview broadcast on 4th April. It was an in depth conversation about VM in general and my involvement with it. The second was for their Sanskrit news programme and about 15 minutes in length. This was more to do with my visit and the IAVM. Both will be on YouTube in due course. Ms Bhardwaj is the principal. This workshop was given to a mixture of teachers, children and parents. About 200 in all. Like Tagore International, the JMV would like to integrate VM into their curriculum. It is these two schools, perhaps also with GIIS, that the IAVM could work with collaboratively principally because the teachers and principals are keen. The Speaking Tree is one supplement of the Times of India and deals with spiritual and metaphysical issues. The interview was published on 24th April. The main proposal was for the IAVM to hold a VM conference either in December, January or March next and the ICCR to fund and manage all the logistics. Mr Rajasekhar is keen and would like this conference to be big. He thought that inviting several institutions would be good and also to ask the British Council in Delhi to help with funding. Next year is the 70th anniversary of independence and there will be events and celebrations to mark India/Britain year. He asked me to put a proposal framework together and send it to him. This is an ongoing project. This is a fairly new school (up to Class IX so far) but has several branches in India and overseas. The meeting was with a few teachers from this school and many more from their other schools in Bangalore, Japan, Thailand, UAE, and Malaysia. They are very open minded and keen to take up VM. The principal of this school was one of the guests at the Tagore meeting. The workshop was with a group of Class 6 and 7 students. I did not get the impression that anything will materialise from this because the key issue is whether or not the Maths teachers are keen. Without this it will be difficult for anything to progress. Some of the school meetings, not all of which are mentioned here, have been useful in learning about their needs in respect of VM and it may be possible to work with them in developing an integrated curriculum. The IAVM can work with some of these schools. I am also in contact with Dr Ashish Arora, who has been running teacher training in VM in the Punjab. Government departments generally seem to have closed ears and closed minds so it looks like expansion of interest will initially come from grass-roots level. The meeting with the ICCR was very fruitful and they can assist the IAVM in running a large conference in Delhi. This will publicise VM in quite a big way. What is very clear is that there is an expansion of interest in Vedic Mathematics at the grass-roots level. Time will tell if the curriculum authorities concerned give attention to this interest.